Possibly the finest atlas map of Chile to appear in the 19th century. 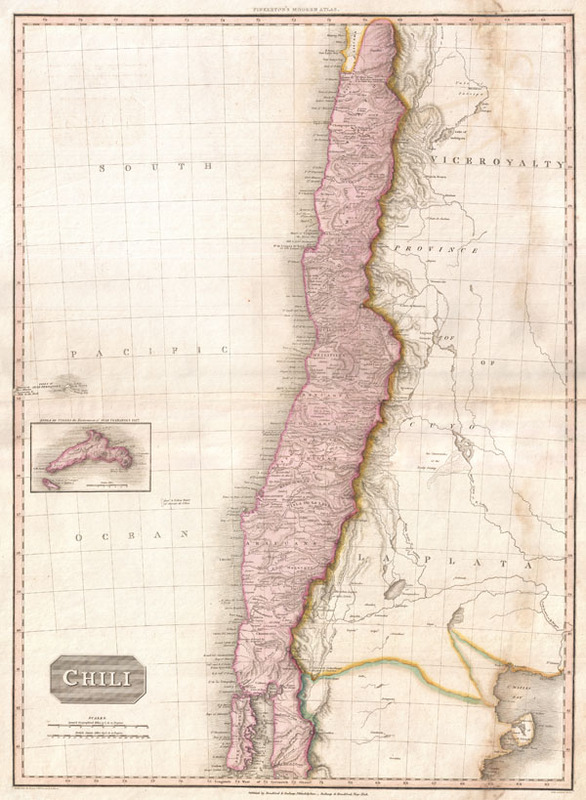 This is John Pinkerton's stunning 1818 map of Chile. Covers the southwestern coast of South America from the Atacama Desert to the Isle of Chiloe. This beautifully rendered map is truly a masterpiece of engraving, with mountain ranges, lakes, deserts, and rivers excited with such precision that the result appears almost three dimensional. Pinkerton injections astounding detail throughout with countless towns, cities, geographical features, rivers, islands and bodies of water noted. Names numerous important mountains and volcanoes in the Andes, including Aconcagua, the largest mountain in South America. Possibly the finest atlas map of Chile to appear in the 19th century. Drawn by L. Herbert and engraved by Samuel Neele under the direction of John Pinkerton. This map was issued in the scarce American edition of Pinkerton's Modern Atlas, published by Thomas Dobson & Co. of Philadelphia in 1818. John Pinkerton (February 17, 1758 - March 10, 1826) was an Scottish writer, historian, and cartographer. Pinkerton was born in Edinburgh, Scotland. He was a studious youth with a passion for the classics. As a young man, he studied at Edinburgh University before apprenticing as a lawyer. Around this time, he began writing, with his first book, Elegy on Craigmillar Castle published in 1776. Pinkerton moved to London in 1781 to pursue his writing career in earnest. He successfully published several works of literature, poetry, and history. Pinkerton proved passionate in his literary and historical writings and, his correspondence with other cartographers has been labeled as aggressive, even insane. In addition to his work as a writer and historian, Pinkerton was one of the leading masters of the Edinburgh school of cartography which flourished from roughly 1800 to 1830. Pinkerton and his contemporaries (Thomson and Cary) redefined European cartography by abandoning typical 18th century decorative elements such as elaborate title cartouches and fantastical beasts in favor of detail and accuracy. Pinkerton's principle work is the Pinkerton's Modern Atlas published from 1808 through 1815 with a special American reissue by Dobson and Co. in 1818. Pinkerton relocated to Paris in 1818, where he managed his publishing business until his death in 1826. Thomas Dobson (1751 - 1823) was an American publisher active in Philadelphia during the late 18th and early 19th centuries. Dobson was born in Edinburgh, Scotland in 1751 and emigrated to Philadelphia c. 1780. In Philadelphia, he established a successful printing business by republishing edited and updated versions of important British reference materials in matching quality but at a much lower price point. He is best known for publishing the first American edition of the Encyclopedia Britannica. He also published America's first Hebrew Bible. Cartographically Dobson's most notable work is 1818 republication of Pinkerton's fantastic Modern Atlas. Pinkerton, J., A Modern Atlas, from the Lates and Best Authorities, Exhibiting the Various Divisions of the World with its chief Empires, Kingdoms, and States; in Sixty Maps, carefully reduced from the Larges and Most Authentic Sources. 1818, Philadelphia, Thomas Dobson Edition. Good. Minor dampstaining in the right hand quadrants. Else clean. Blank on verso. Rumsey 0732.055 (British edition). Phillips (Atlases) 724. National Maritime Museum, 409. Phillips (America) page 806.